In 2017 we introduced late night comedy and in 2018 it was extended for the full 4 days, starting at 23.30 each night. As a family-friendly festival we felt it best to keep the comedy as a late night event as the language might be “fruity”. Below was the 2018 line up. We’re delighted to say that Late Night Comedy will be returning to Wickham this summer starting at 23.30 on all four nights. 2019 artists will be announced during the coming weeks. Last year we were treated to a Q&A with Tom Walker a.k.a. Jonathan Pie which has racked up 144K views on YouTube. So we’ve invited him back to perform in character. 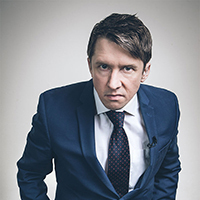 With Jonathan Pie headlining on the Friday, we will be moving the comedy to the second main stage. The other nights will be in the Quay West Cave Stage. Below is further information about the comedians. 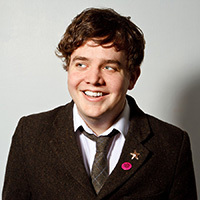 Foster’s Edinburgh Comedy Award Best Newcomer nominee 2010 GARETH RICHARDS is probably best known for his two years of co-hosting the Sony Award winning Frank Skinner’s Absolute Radio Show. 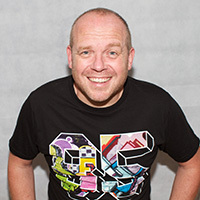 Since then Gareth has appeared on Russell Howard’s Good News (BBC3), Live at the Electric (BBC3), performed live on Radio 1 and supported Frank Skinner on his 2014 Tour. Described by The Guardian as “Like TV Burp if Harry Hill was on PCP”, David Trent has been blowing minds since 2012 with intelligently depicted yet hilariously explosive observaHons of modern day pop culture. Smashing on to the comedy scene in 2012 at the Edinburgh Fringe FesHval with his debut solo show ‘Spontaneous Comedian’ David Trent wowed audiences and criHcs alike with his unique brand of tech heavy comedy and high octane audiovisual onslaught, selling out the 26 night run and receiving a nominaHon for the coveted Foster’s Comedy Award for Best Newcomer. Further recogniHon quickly followed with a run at noted London comedy haunt, The Soho Theatre and another nominaHon, this Hme for Best Breakthrough Act at the 2012 Chortle Awards. James has an effervescent and exuberant style. He draws on his life experiences as a man to feed his routines. He’s been described by many as an ‘everyman comedian’. Women laugh at his hilarious observations and self-depricating style, and men laugh with him, feeling his pain and his frustrations….you rarely know where James will go with his comedic tales and punchlines, but he always takes the crowd with him, laughing all the way…. Jonathan Pie is the comedy sensa0on who sa0rises the world of poli0cs and the media. A frustrated news reporter known for ven0ng his spleen in unguarded “off-camera” rants, his online videos have been viewed by millions worldwide. As an old-school leBie, Pie’s anger is usually directed towards the Tories. But he has also been known to ques0on the tac0cs of the leB, which has got him into trouble from 0me to 0me. Pie is the brainchild of actor Tom Walker, who first brought the character to life in September 2015. He became a viral hit when he famously ‘lost it’ outside the Houses of Parliament, and his fan base has con0nued to gain momentum ever since. He has recently finished a UK tour of his live show, including 2 shows at the Hammersmith Apollo. 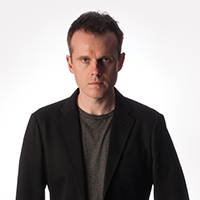 Andrew Doyle is one of the UK’s foremost poli0cal sa0rists and co-writer for Jonathan Pie. As a stand-up comedian he has performed numerous sell out runs at the Edinburgh Fes0val. 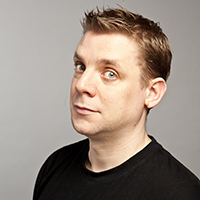 Winchester’s own Paul McCaffrey, as seen on Impractical Jokers (BBC3) Russell Howard’s Good News (BBC3) and Stand Up central (Comedy Central). 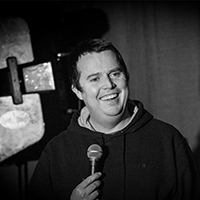 Michael Fabbri has been a stand up since 2003 and regularly performs at major comedy clubs throughout the UK and all over the world. He has worked as a writer for Radio and TV and recently had his own stand up series: ‘Dyslexicon’ on BBC radio 4. He has done several solo shows at the Edinburgh fringe festival and worked as a support act for Micky Flanagan, Lucy Porter, and Stephen K Amos. He has an affable and electric style of comedy, with material that ranges from the cerebral to the smutty. Tanyalee Davis is a 3 foot 6 inch standup comedian form Canada who is now headlining at comedy clubs, colleges, and comedy festivals throughout the UK, and the world with her own unique perspective and somewhat racy brand of comedy. In January 2011, Tanyalee performed her ONE WOMAN SHOW, 4 nights a week for 6 months, just off the Las Vegas strip. Since arriving in the UK back in 2013 Tanyalee has stormed the UK comedy scene earning her appearances on prestigious comedy shows such as Live At The Apollo, The Last Leg & The John Bishop Show. Tanyalee also supported Frankie Boyle on his 2012 UK Tour. 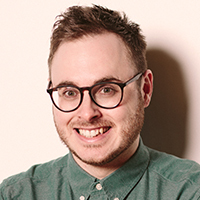 Joe’s writing career began when his first book Touch and Go Joe about his experiences of OCD was published, since then he has made a name for himself as a stand-up comic, writer and speaker. 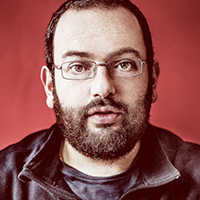 Joe now focuses mainly on his unique brand of political comedy and in 2012, Joe was asked to support Alexei Sayle on his comeback tour. Joe is now frequently performing stand up in comedy clubs around the UK.